Late-18th century Quaker-plan house with significant Civil War ties. An 1800's Federal-era plantation house, restored and furnished with period antiques and fine art. Site of Rev. and Mrs. Burwell's School for Young Ladies from 1837-1857. Originally the Orange County Courthouse (1790 -1844), the church was moved intact two blocks from it's original site. A Romanesque Revival church, built over an eight-year span including the Civil War. The first Methodist church in Hillsborough was designed and built by John Berry (also worked on Courthouse). Built on the site of the first St. Matthew's Church (c. 1768) and the site of the 1788 NC constitutional Convention. Historic African-American Cemetery dating back to at least 1885. View the summer home of Alfred Moore and the lush grounds & gardens surrounding it, just outside of Hillsborough. Reconstructed 17th century Occaneechi village on the banks of Eno River. Greek-revival building that is still in use today. Front lawn is used as a 'town square' for outdoor performances and festivals. The first St. Matthew's Church stood here. Museum that explores Orange County's unique history through interactive exhibits. 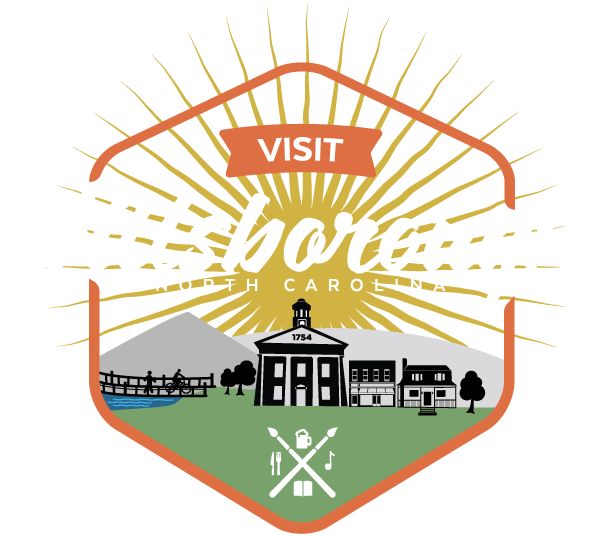 An 1800's historic home, restored by the Town that now serves as Hillsborough's Town Hall. Original church built in 1768, burned down, and was reconstructed in 1825.